Reading picture books is a great way to cultivate compassion and start conversations about the value & beauty of difference with kids. Here's 25 wonderful picture books from my library you might not be aware of that you can find on Amazon or in your local library. Enjoy! Here are five Nigerian folktales, retold in language as rhythmic as the beat of the story-drum, and illustrated with vibrant, evocative woodcuts.Here are five Nigerian folktales, retold in language as rhythmic as the beat of the story-drum, and illustrated with vibrant, evocative woodcuts. Slave lullabies, created from the African-American experience, were sung to give hope for a better time to come. Although these lullabies were born of hardship and overwhelming sadness, they can be thought of as musical stories for children and adults. By turns soothing, playful, empowering, and bittersweet, the songs convey the love of parents for children. Since childhood, Alice McGill has been collecting and singing these lullabies. Here they are preserved along with vibrant quilt collages and a CD recording of each song, introduced and sung by McGill. 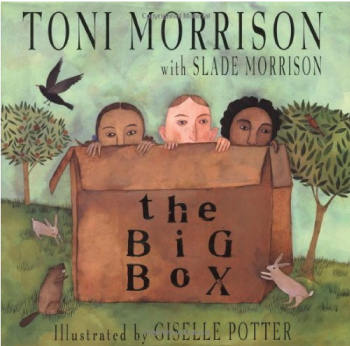 Her voice is rich and resonant, adding yet another dimension to these moving pieces of oral history. This beautiful package of lullabies, artwork, and personal history invites readers of all ages to sing along and remember the powerful words and melodies of a people struggling to survive. Yoon's name means "shining wisdom," and when she writes it in Korean, it looks happy, like dancing figures. But her father tells her that she must learn to write it in English. In English, all the lines and circles stand alone, which is just how Yoon feels in the United States. Yoon isn't sure that she wants to be YOON. At her new school, she tries out different names―maybe CAT or BIRD. Maybe CUPCAKE! My Name Is Yoon is a Bank Street Best Children's Book of the Year. Cassie Louise Lightfoot has a dream: to be free to go wherever she wants for the rest of her life. One night, up on "Tar Beach" — the rooftop of her family's Harlem apartment building — her dream comes true. The stars lift her up, and Cassie Louise Lightfoot is flying over the city, claiming everything she sees as her own. Once, all the stories in the world belonged to Nyame, the Sky God. He kept them in a box beside his throne. But Ananse, the Spider man, wanted them -- and caught three sly creatures to get them. Starting in the playground with a personal encounter and moving outwards to a park, a city, a mountain and eventually encompassing the globe, each beautiful scene is portrayed through stunning artwork that perfectly captures the feel of this text. 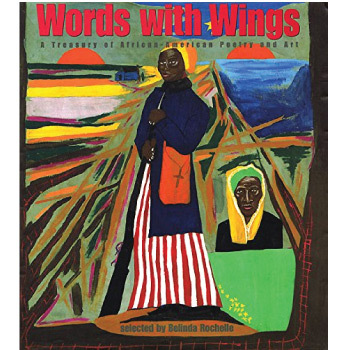 With work that spans the nineteenth century through the present, this stunning collection pairs twenty poems by distinguished African-American poets with twenty works of art by acclaimed African-American artists. Renowned poets and artists such as Maya Angelou, Langston Hughes, Rita Dove, Countee Cullen, Jacob Lawrence, and Paul Lawrence Dunbar powerfully explore themes of slavery, racism, and black pride, among many others. Named as one of the New York Public Library's "100 Titles for Reading and Sharing," this important collection was described as "a stirring book that will take [readers] up close and also extend their view of themselves" in a starred review by Booklist. Have you ever been to Tokyo, Japan? Far away, in the Pacific Ocean, Tokyo is a busy city of color, activity, celebrations, gigantic buildings, and much more. Seven-year-old Mimiko lives in Tokyo, and here you can follow a year’s worth of fun, food and festivities in Mimiko’s life, month by month. Learn the right way to put on a kimono and see Mimiko’s top ten favorite meals—just try not to eat the pages featuring delicious wagashi! Every design has a name and means something in the powerful past and present richness of the Black tradition. Mama's and Great-Grammaw's gentle fingers weave the design, and their lulling voices weave the tale, as they braid their children's hair into the striking cornrow patterns of Africa. Caribbean renditions of nursery rhymes apply the lilting, musical beats of the region to familiar favorites and are accompanied by colorful scratchboard illustrations that highlight such images as Mother Goose playing the marimba. What simpler way could there be to express to children the beauty and the harmony in the world around them than through the lyrics of this song by George David Weiss and Bob Thiele, made famous by the great Louis Armstrong? 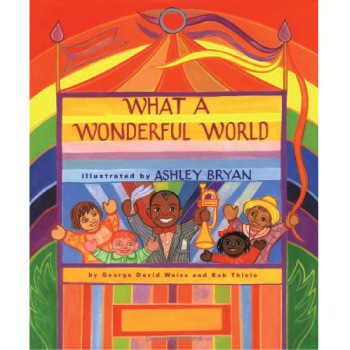 And what better visual accompaniment than the bright colorful artwork by award-winning Ashley Bryan depicting children of many backgrounds (and Louis Armstrong himself) performing a puppet show that brings the lyrics to life. Here is a book of brightness, wonder, and hope to be shared by all. Mohandas Karamchand Gandhi, known by his followers as Mahatma -- or great soul -- was born in India in 1869 and grew up to become one of the most influential and well-respected political and social leaders the world has ever known. An adamant idealist and a courageous thinker, Gandhi identified himself with the struggles of the common people. He became the sole voice of the downtrodden and the exploited and believed fervently in the notion that "hatred can only be overcome by love." He vowed to instigate social and political change through nonviolent means and succeeded in changing India's prejudicial caste system and winning India's independence from British rule. Gandhi's teachings inspired Martin Luther King's nonviolent civil rights movement in the United States and Nelson Mandela's anti-apartheid movement in South Africa. Gandhi's philosophies of nonviolence and peaceful protest continue to inspire people around the world. In beautiful language and exquisite illustrations inspired by Gandhi's own belief in the simplicity and truth of life, Demi captures the spirit that was Mahatma Gandhi and pays homage to this great man. Tiger Tiger on a tree Is it true? Can it be? Did he fly? Did he flee? Did he fall and hurt his knee? Did he cry? Did he plead? If you want to know: read The tale of a wild tiger cub who wanders into an Indian village, and the reactions he encounters from the stunned village inhabitants. The art, verse and typography run and bounce off the page, drawing both the curious child and the quizzical adult into the lively world of the book. Now translated into eight languages and having sold 40,000 copies worldwide, this is the first softcover edition of a quintessential Tara title. We are all alike...we all have hearts and brains. We are all different...we do not think or feel the same way." An important lesson for children, by children. We Are All Alike... We Are All Different celebrates the multitude of differences in our society — at a time when understanding tolerance and diversity have never been more important. Written by children for children, We Are All Alike... We Are All Different reinforces multicultural and anti-bias learning and appreciation. With original drawings and their own lyrical words, a class of kindergartners share the ways they look and feel, the games they play, the foods they like, the homes they live in, and the families they live with, concluding that "We are all alike. We are all different. We are a family." From the author of FRIDA comes a jangly, jumpy, beboping book about Dizzy Gillespie, the clown prince of jazz. This is the story of Dizzy Gillespie, a real cool cat who must have been born with a horn in his hands, judging from the way he played the trumpet. Jazz was his ticket on a train to better days, and he left his hard life in a small town for New York City and the hottest band around. But did Dizzy stand straight and play right? NO! He was a clown. He hit high notes, low notes, never-been-heard notes, and before he knew it, Dizzy created a whole new music: BEBOP. This is a story about a boy who breaks all the rules -- and finds his own personal heaven along the way. Tweet them to me: @cynthiajabar or share them in the comments below.